From about forty years old it gets more difficult to focus close to. This is Presbyopia. Why do I have Presbyopia? The flexible lens inside the eye gets stiffer all through our lives. After 40 the muscle which controls the lens finds it harder to keep up with the stiffening lens and close focusing gets more difficult. 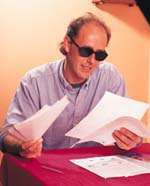 To build up the focusing muscle in the eye use Trayner pinhole glasses to help you read in good light for fifteen minutes a day.